2018 proved to be another amazing year for Nutickets. We kicked it off by setting a mission to provide an outstanding product and service by offering quality, innovation and building global partnerships. 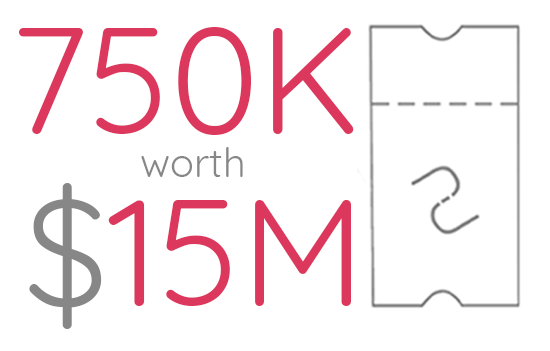 With over 750,000 tickets processed through the Nutickets software, worth a total of $15m, we can happily say, mission accomplished! We had the pleasure of working with some fantastic companies, running events across the globe. 2018 was our best year yet! Our partners are our business. Although we are a technology company, people are at the forefront of our existence, and 2018 proved to be no exception. Over the last 12 months, we have taken time to build solid partnerships with companies who share the same goal of bringing people together through great experiences. Our brilliant network of partners now include CSSC, Boat International, Chivas Masters, Magical Festival, Edge Travel, IDC & Famoco. As the year began, we made it our goal to increase our reach on a global scale by connecting with companies worldwide. We’re proud to say our software reseller network now spreads across 36 countries, including Europe, Mexico, Caribbean, Saudi Arabia, South Africa, Botswana and Nigeria. With the aim of making our payment processes seamless for all of our partners, we now work with even more global payment providers. Once you go cashless, you never go back! Last year, our innovative cashless technology transformed the experience at a variety of events, replacing the need for inefficient cash or tokens, and improving access control. Magic Festival wowed their fans with a completely cashless payment system. Chivas Cocktail Masters and The Gin Affair replaced their paper tokens with our digital solution. This streamlining tool can also be used for entry and attendance tracking for corporate events, such as the De Beers Conference and MTN's VIP Experience. Want to know the best part? We have now introduced the first cashless payment solution for iOS devices! The effort and detail that goes into our work when building and creating bespoke software for our customers, needed to be portrayed across all of our platforms, and there was no better place to start than our website. Your browsing experience is super important to us, so in 2018, we launched a whole new look to showcase our latest technology, fantastic client stories and global network.